*Please note our new local direct phone number. Fill out this short form and a Ryan's Auto Glass representative will contact your client shortly. We use OEM quality products along with certified technicians to deliver 100% satisfaction. Ryan's Auto Glass replaces all types of auto glass with same day or next day service. 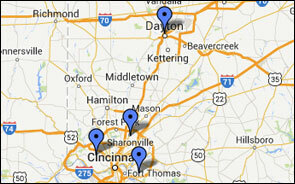 With three service centers in the greater Cincinnati area, a Ryan's location is easy to find.